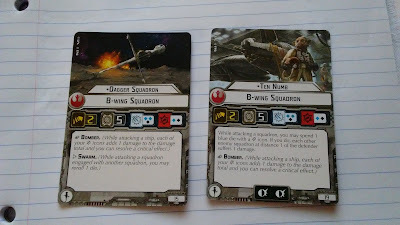 Final Squadrons from Corellian Conflict, and we can dig into the meat of Wave 5! 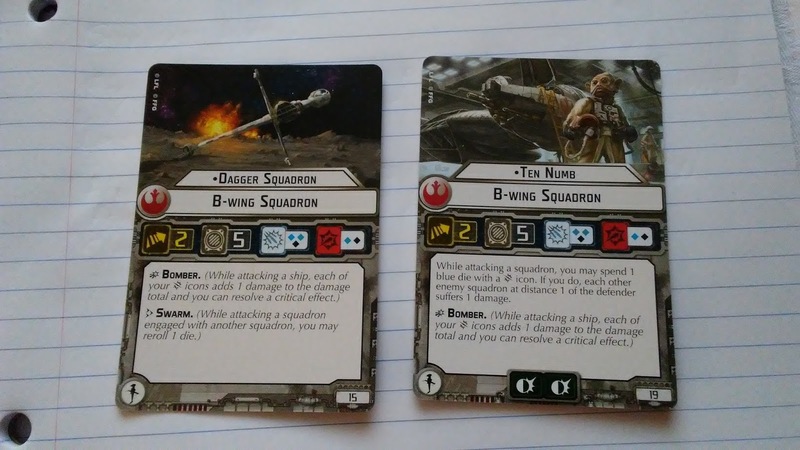 An interesting anti-squadron bump to the traditional B-Wing, where Dagger gets an extra Black in exchange for one of the generic's 3 Blues, and access to the Swarm Keyword. 1 point is a fairly harmless cost over the generic, especially if you're doing Rieekan things. Might combo well in a hybrid role along with a Z-95 swarm. "While attacking a squadron, you may spend 1 blue dice with a Critical Result Icon. If you do, each other enemy squadron at distance 1 of the defender suffers 1 damage." Everyone is very excited about this guy, and for good reason. With reroll shenanigans like Toryn Farr, or double tap shenanigans like Adar Tallon or Yavaris, you can chew through enemy fighters like Mauler Mithel normally does for the Imperials. He is slow, and that is his only trick though - no boosted bombing damage for him. Expect to see a lot of him in Combat Air Patrol style fighter configurations.